P.F. Chang’s is ringing in the Year of the Dragon with a special gift for guests. In honor of the 15-day Chinese celebration, guests who visit any P.F. Chang’s in the United States from January 23 through February 6, 2012 will receive a red envelope containing an unknown reward. On the guests’ next visit, a P.F. Chang’s manager or server will open the envelope and reveal its contents. * The secret offer could be a discount on the meal (10%-50%), a free appetizer or dessert, and must be redeemed by March 4, 2012. Red envelopes are a traditional Chinese gift of the New Year and the red color symbolizes good luck while warding off evil spirits. To honor the occasion, P.F. Chang’s has partnered with Tsingtao Lager, China’s #1 beer, to create a specialty cocktail. The limited edition Dragon Punch features Tsingtao, Skyy Infusions Dragon Fruit Vodka and is mixed with Siracha for a balance of sweet and spice. The red envelope promotion extends beyond the restaurants with a Facebook application launching on January 23. Fans of P.F. Chang’s can open a virtual red envelope through February 13 and enjoy a fortune, a coupon for a P.F. Chang’s Home Menu frozen meal and t-shirt, or a $25 P.F. Chang’s restaurant gift card. When one things of red wine from the island of Sicily they think of Nero d’ Avola, but there is another grape that deserves some attention Frappato. La Bella Vita “The Good Life” produces Frappato from the western side of Sicily around the city of Marsala. Frappato grapes makes light bodied wine and has a grapey nose. 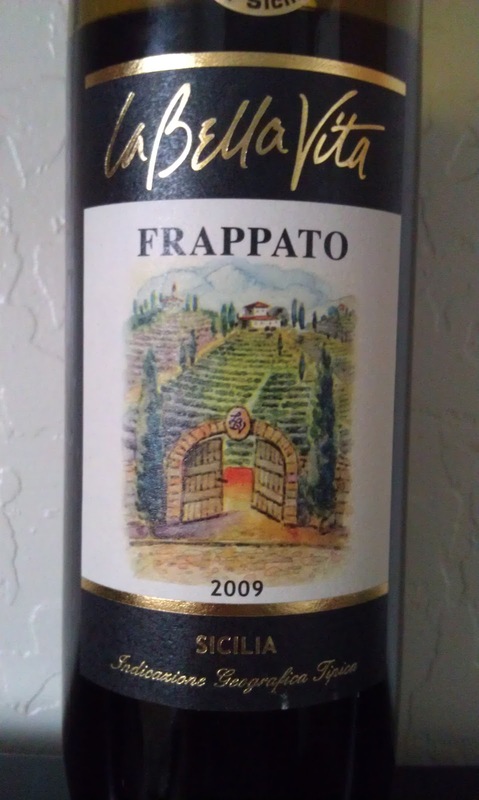 Dark red to the eye, Frappato on the palate is offers good fruit and earthy nuances. Medium tannins along with a hint of spice and cherries it’s dry with nice finish. This wine is best paired with red meats and game and could also go nicely with aromatic cheeses. This past fall, Scottsdale-based Whoopie Baking Co. made its foray into the world of whoopie. The venture is a labor of love and passion for this women-owned business. Based in Scottsdale, Arizona, owners Jennifer Brya and Karen Linkins were seeking a new venture that exercised both their entrepreneurial drive and creative spirit. Health policy researchers by day, the two combined their left and right brain talents to craft a light-hearted and community-driven business model that values collaboration, living a life of joy and savoring simple indulgences. While many Northeast natives who now call the Valley home may already be familiar with these delectably compact cake-like treats, Brya and Linkins are often posed the question, “What exactly is a Whoopie Pie?” The answer: It’s kind of like a cupcake sandwich with frosting in every bite! The pies have also been termed a “dessert slider”, as their appearance mirrors that of the popular dish of mini hamburgers or other bite-sized sandwiches found on many restaurant menus. The just-sweet-enough treats on Whoopie Baking Co.’s menu come in a wide variety of flavor combinations made with the highest quality ingredients, no preservatives and no trans fat. Each whoopie is filled with a proprietary creation of buttercream frosting and homemade marshmallow fluff, resulting in a light, yet not overly sweet, center. A few offerings include the Morning Whoopie which combines rich Chocolate cake with an Espresso Buttercream Fluff. The Sweet & Salty Whoopie satisfies cravings with Chocolate Cake and a Salted Caramel Buttercream Fluff filling and the Mimosa Whoopie marries an Orange Cake with a Champagne Buttercream Fluff inside. Seasonal flavors include the über popular Spicy Whoopie with a Pumpkin Spice cake and Cinnamon Buttercream Fluff, while the Yuletide Whoopie features Chocolate Cake and a festive Candy Cane Buttercream Fluff. 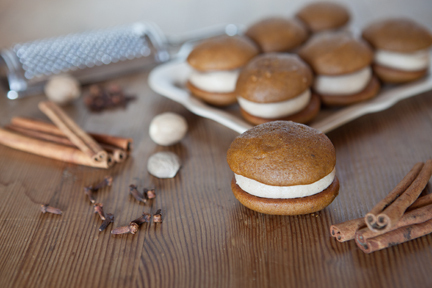 And just added to the holiday lineup is the Gingerbread Whoopie filled with an Eggnog Buttercream Fluff. Whoopie newbies and longtime fans are already finding fun occasions to serve Whoopie Baking Co.’s adorable pies, from bridal showers and edible wedding favors, surprise birthday gatherings and bunko parties, to holiday entertaining. Always a conversation starter, the whoopies make for a unique and memorable dessert option no matter the season or event. The ladies also welcome creativity from their clientele and can craft new flavor combinations to fit almost any theme. The Whoopie Baking Co. is currently an internet-based business, utilizing a local commercial kitchen to do their baking and recipe testing. Orders may currently be placed online with local delivery available across the Valley. Out-of-state shipping is also an option for those wishing to send some whoopie to far away family and friends. The ladies also plan to acquaint locals with their new business at some of the Valley’s busy farmer markets throughout the coming months. For more information and complete menu please visit whoopiebakingco.com or call 888.608.1229. Hacienda Lopez de Haro is one of several projects by the innovative Spanish wine company Vintae. Focusing on 6 different Designations of Origin(D.O.) throughout Spain, Jose Miguel Arambarri Terrero, his sons Ricardo and Jose Miguel and their team offer unique wines showcasing their passion and progressive thinking in wine making. Ignite Food is here! We’d like to talk about food, and we think you’d be a great person to get the conversation going. Ignite Food is currently accepting submissions for an event focusing on stuff we love to eat, grow, and cook—food! Do you love food? Do you work with it? Is there something special you could share about it with others? Tell us! At Ignite Food, you’ll have five minutes to speak and 20 PowerPoint slides (should you chose to use them) to share your passion with a captive audience. Mark your calendar for Ignite Food. Submit a presentation, or reach out to your friends. Your presentation can be about anything related to food: diet and lifestyle, cooking, drinks, food economics, pairings, ingredients, fun facts, dining out, food art, and more. The only topics we don’t want are pitches about a product/service you sell. Other than that, share the things you really love, no matter how strange or obscure you think it might be! Visit our website http://ignitephoenix.com/ to find all the juicy details, submit a presentation, or become a sponsor. We can’t wait to see you on March 19th! The holidays aren’t over at Fleming’s. 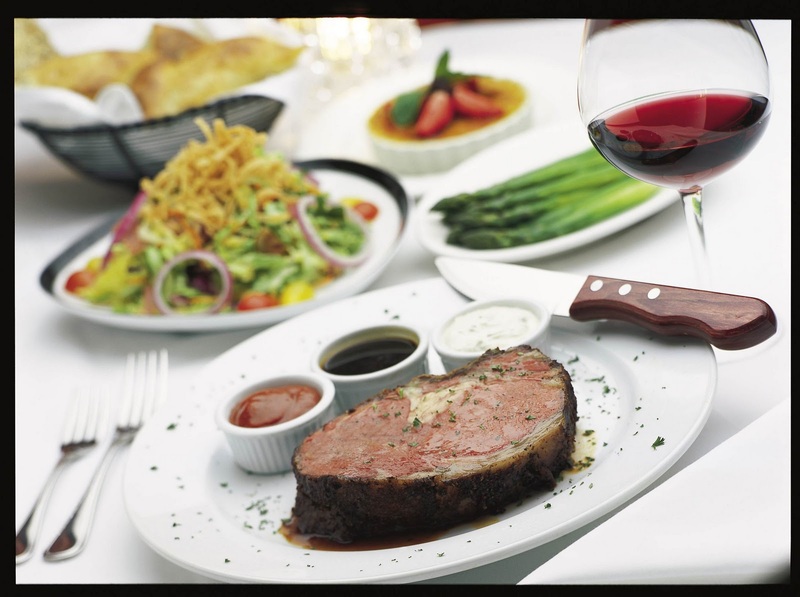 Their popular Sunday Prime Rib Dinner continues in 2012 with a special price during through Sunday, February 5. Please visit www.FlemingsSteakhouse.com to find your closest restaurant and hours. *excluding tax and gratuity. Fleming’s Prime Rib Dinner is available every Sunday, but at the special price of $29.95 per guest January 1 – February 5 only. RAYMOND, Napa Valley Sommelier Selection Cabernet Sauvignon, 2009$8.75 per glass, $35 per bottle. This suggested wine pairing is available at this special price Sunday’s only from Jan 1 – Feb 5, 2012.